Hdmi extender with hdbaset ™ technology capable of extending an hdmi signal up to 70 meters (1080p) or 40 meters (4k) with a single cat-5e cable or higher. Supports resolutions up to 4k ultra hd (3840 x 2160 @ 60 hz 4: 2: 0) with 7. 1 hbr (high bit rate) channels for lossless digital audio. 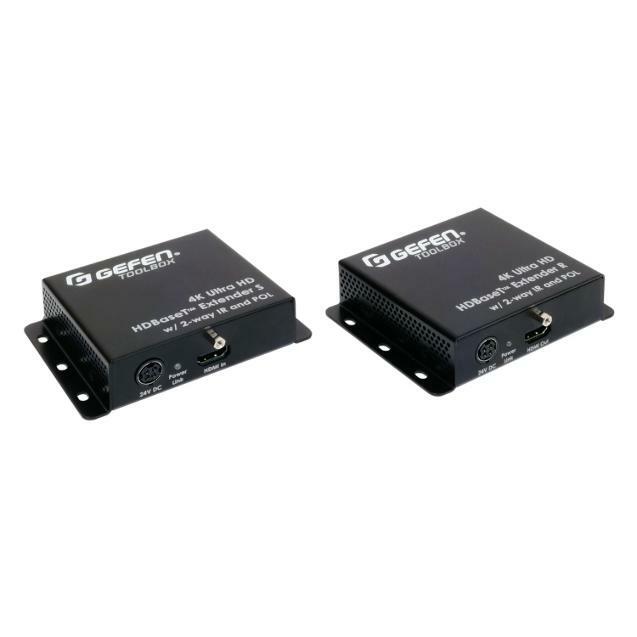 In addition, it provides two-way ir extension for easy control of a sources/v located near the emitter and sending control commands to the monitor or other device located near the receiver. On the other hand, the pol (power over line) technology allows the transmitter or receiver to be fed through the cat5-e cable as it is more convenient (only one requires power supply to the wall socket), simplifying the installation. 1. The use of screened cable (stp) cat-5e or cat-6a is recommended. Unscreened (utp) cat-5e or cat-6a cable may be acceptable depending on cable quality but is not the preferred option. Care must be taken to keep cables away from current cables and other sources that cause electromagnetic interference. 2. This product supports sources up to 4k 300 mhz (60 hz 4: 2: 0 or 30 hz 4: 4: 4). It is not compatible with sources capable of displaying hdr or 4k 600 mhz (60 hz 4: 4: 4).